We just got back from the most wonderful weekend trip that we are both hoping had lasted longer. But all good things must come to an end?! I don’t really like that phrase, but sometimes you have to admit defeat. While we were there, I ended up binging on some fantastic lebanese food (read: Hummus, Pita, Green Salad and Fried Eggs for breakfast everyday) and clearly haven’t got over my obsession yet. 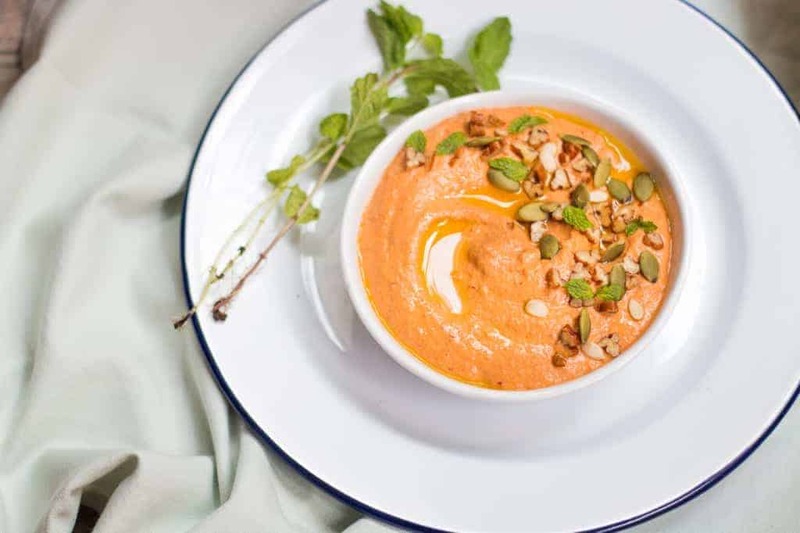 Because this Lebanese style Pecan Red Pepper dip or Muhammara as it’s famously known is what I’m going to be licking off my plate today! One of the aftermaths of a holiday is an empty fridge. And mine had nothing except four day old milk lying in it. Ugh. Imagine returning home at 9 in the night, half drenched, because Bangalore decided to pour it’s heart out and realizing you don’t even have milk to make a half decent cup of coffee. Life looked bad. Till I decided to try out PepperTap. I’ve tried out some of the more popular online grocery delivery apps but have been left disappointed recently. First thing that stuck me was the easy navigation of the app. It took me just under five minutes to find everything I needed to stock up my fridge for the next day. Plus it gave me an option to have everything delivered within the next two hours. I decided to take pity on the delivery boy and not put him through Bangalore’s downpour; and checked out to have everything delivered the next day. Imagine my surprise when I got a call the next morning enquiring if I was at home and then a SMS letting me know that my order is out for delivery. It all happened on time and so smoothly. There were no reminders for grocery to be delivered or waiting beyond the promised time. Everything, including vegetables were fresh! I’m totally loving PepperTap’s service! I received the groceries just in time to make this delicious Muhammara for lunch. I first had this dip a few weeks ago, and fell head over heels in love with it. The sweet, smokey flavors of roasted bell peppers combined with garlic, nuts and cumin stay with you, because they are so unexpected. 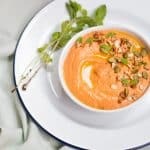 Paired with some pita bread and salad, you have the makings of a wonderful light dinner or lunch. Traditionally made with walnuts, I realised a little too late that I had run out of them. But I had some pecans on hand and really couldn’t tell the difference. I’m sure roasted almonds would taste great as well! If you try this out, leave a comment for me or give me a holler on facebook or twitter. 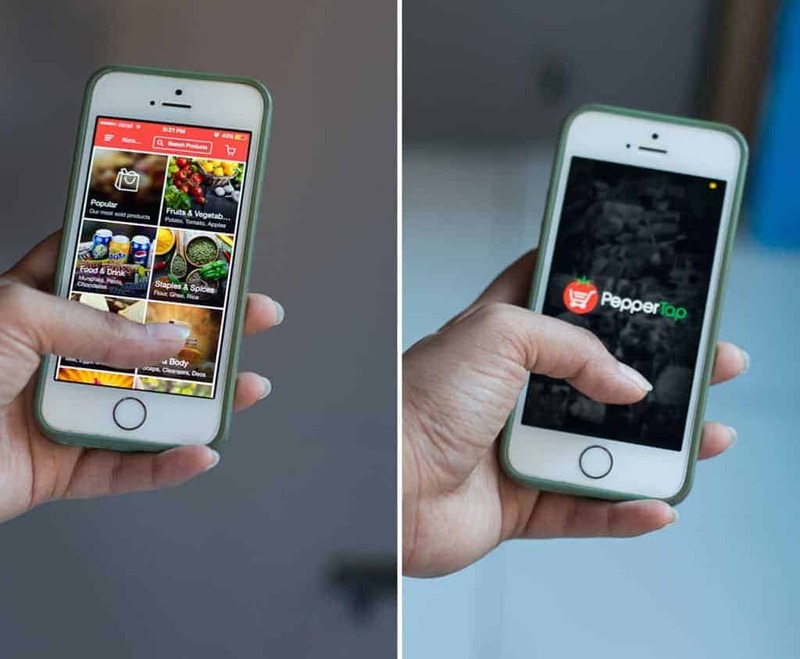 And if you’d like to try out PepperTap, check out the app store, or visit their website. 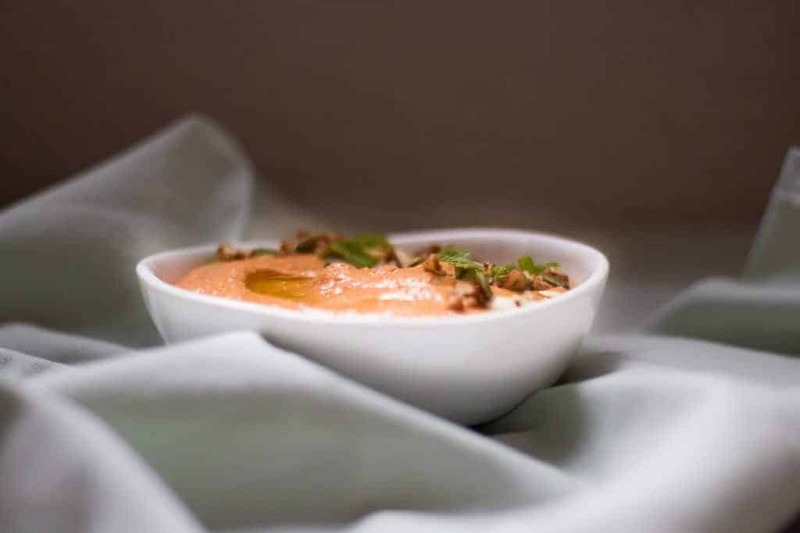 A Middle Eastern red pepper dip – Muhammara is made vegan and gluten free with pecans. 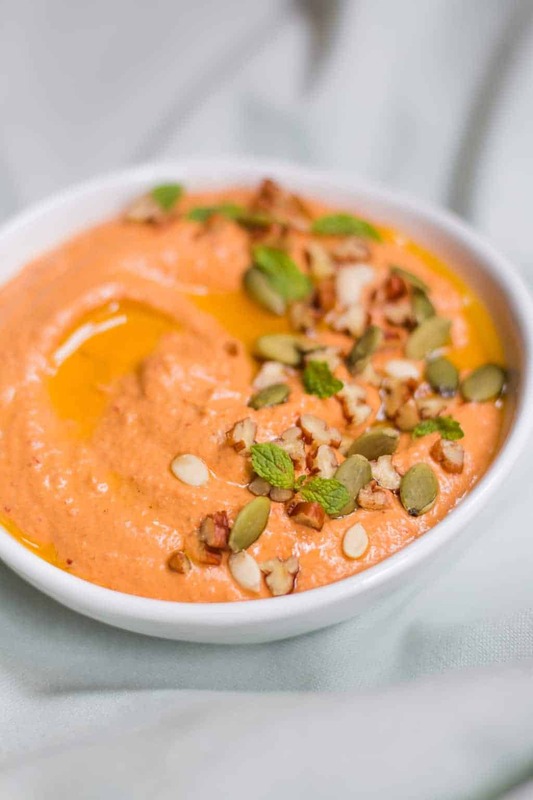 This delicious sweet spicy dip is a great party appetizer. Lightly brush each Red Bell Pepper with Olive Oil, sprinkle with a bit of salt and roast on all sides. Once roasted well, peel off the skin and deseed and chop the peppers. Add peppers, garlic, cumin powder, pecans, chili flakes, lemon juice and salt to a blender and blend till smooth. Add olive oil and pulse a few times till combined. Top with pumpkin seeds, mint and a drizzle of olive oil. Serve with warm pita. I love a good pepper dip – this would be awesome at a dinner party! Looks really yum…..I want bread sticks and the dip!